Choosing anything for your wedding can be overwhelming. An hour browsing Instagram and Pinterest for wedding cake ideas will take you all over the place unless you remain focussed on a few key considerations. Fondant or buttercream? Fondant cakes are covered in a sheet of icing called sugarpaste. This gives a smooth (immaculate in the right hands) finish on which realistic hand-crafted sugar flowers and other details are positioned. These are not edible really, but the fondant covering is. I'm HUGELY biased because I only make buttercream cakes, but I also cook at weddings and anyone who works front of house at a venue will tell you that most people do not eat fondant icing. They peel it off to get to the cake and filling. Buttercream cakes obviously don't have the fondant covering. They are covered in a thick layer of smooth or textured plain vanilla or flavoured buttercream. Any decoration is piped or they may be dressed with fresh flowers. Buttercream cakes are usually cheaper, as a full design is quicker to achieve. What style of cake should you have? Good question. Start with your venue. Is it formal and elegant? rustic? urban? A contemporary cake, with a clean finish and possibly some geometric or linear detail, or decorated quite sparely with fresh flowers will suit a smart city venue. A bolder approach would be to opt for a trendy watercolour or marbled cake finished with touches of gold leaf. This can be achieved in buttercream or fondant. A fresh flower decoration will also suit a country-style wedding, but here a more rustic, textured finish would be more appropriate and the flowers could be more abundant and casually placed. 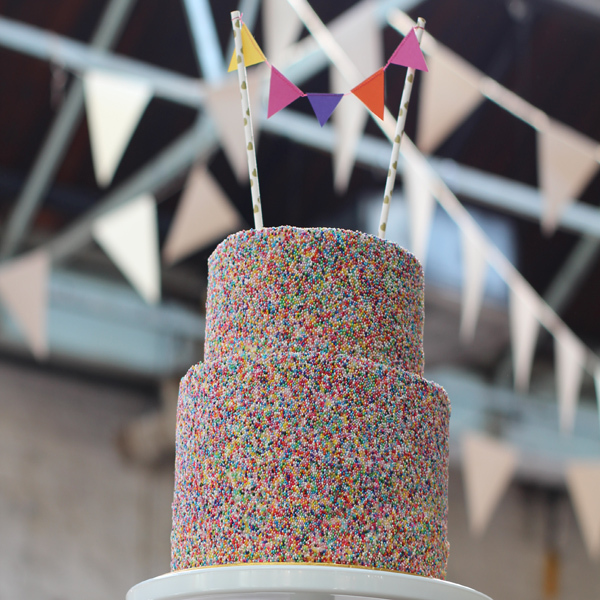 If you've chosen a venue with a quirky feel and lots of character, consider a fun drip cake piled high with meringues and flowers, or even a sprinkle cake. What about colour? This will most likely be informed by other choices you've made: the bridesmaids' dresses, bride's bouquet, table decorations and so on. It's very important that your cake brings together these colours accurately. If you get the chance to sit down with your cake maker, take any fabric swatches or pictures of flowers that will help them achieve an exact match in your cake decoration. You'll most likely be advised by them, and your florist, to avoid primary colours (too corporate) and two colours that oppose each other on the colour wheel, because the contrast will be too great. If you opt for a multi-coloured design for your cake, stick to a palette of five complementary colours. Pastels will always be more popular than dark or bright colours for wedding cakes, but I'm, definitely seeing more of an interest in black or very dark blue cakes for winter weddings. This can look super dramatic, but if you're having a buttercream finish make sure your cake maker starts with a dark chocolate buttercream and adds a little black. Taking white icing to black with food colouring alone will stain your guests' teeth and taste bitter. If you opt for a multi-coloured design for your cake, stick to a palette of five complementary colours. Pastels will always be more popular than dark or bright colours for wedding cakes, but I'm, definitely seeing more of an interest in black or very dark blue cakes for winter weddings. This can look super dramatic, but if you're having a buttercream finish make sure your cake maker starts with a dark chocolate buttercream and adds a little black. Taking white icing to black with food colouring alone will stain your guests' teeth and taste bitter. Do you need a huge cake? Generally speaking a three tier cake (of 6in, 8in and 10in tiers) will feed around 100. Conventionally, a finger portion will measure 1inx1in on the top and will be the depth of a tier (so, roughly 6in these days). This gives you a cake that is18in-20tall. This is quite a big cake, but if you have chosen a venue with high ceilings and huge architectural features, you may want to add a dummy tier at the base to give it more presence. If you are having an intimate celebration with just a handful of guests, maybe opt for a little two tier with a fun topper to give it some height(see previous blog post on these), and serve it as pudding. Give it some character by choosing an unusual flavour - matcha tea or lavender and have it frosted to match. The devil's in the detail. Is there an element, image or theme emerging in your wedding plan that you could use to inform the design of your cake? Most commonly, couples come to me with their invitation and ask for it to be replicated in piping on their cake. This always works well, especially if the same elements have been used in the design of the seating plan and place cards. But I've also recreated a stained glass lampshade that was made by a bride's father when she was small, the lace of a bride's veil, scrollwork that appeared in the stone mantel of a fireplace and the embroidery of a favourite bag. A captivating design will always be attractive, even if it's the print on a shower curtain. If travel is the thing that binds you, why not opt for a cake that combines maps and landmarks of the places you have visited like a sketchbook? A good cake maker will be able to work up a design from literally anything you suggest. How much will my wedding cake cost?